Welcome to Show and Sport. Our store is dedicated to people who dedicate their lives to animals and created by people with over 30 years of canine and equine breeding, show and performance experience and over 20 years in the veterinary industry. We understand that a healthy foundation begins on the inside with natural, drug-free nutrition. Whether your passion is pampered pets, raising a litter or competing with top show or performance dogs or horses; Show and Sport has products to improve their appearance, health and/or optimize performance naturally. Our customers include breed and performance champions, national specialty winners, priceless family companions, service dogs, therapy dogs, national and world championship performance competitors. You won't find harmful drugs, trans-fats, artificial preservatives, artificial color, fillers or soy products in the products on our site. We take pride in providing the freshest products, best prices and unsurpassed customer service. 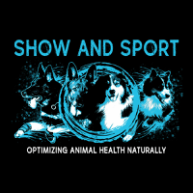 Show and Sport also offers rapid turn around, incentives for group and/or case orders and is proud to support major canine events, animal rescue, health and genetics organizations. Check back often for the addition of more exciting products for your canine companion and make sure to check out our specials.